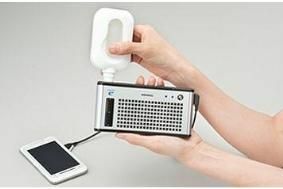 JAPAN: Toshiba launches fuel-cell charger for portable devices | What Hi-Fi? Suzuki has just launched a scooter running on a hydrogen fuel-cell, following up its bike of a couple of years back, Honda is talking about fuel-cell cars and just a couple of weeks ago we had our first drive of Nissan's FRV concept at the company's Advanced Technology Centre. But while the big car companies are saying commercially available fuel-cell vehicles are some years off – Nissan says five years, Honda five to ten – Japanese consumers can this week have a fuel cell in their pocket, ready to charge their mobile phone, iPod and other portable devices. Having shown a prototype fuel-cell mobile phone at CEATEC 2008, Toshiba has now launched Dynario, a standalone fuel-cell charger for any device able to be run from a USB cable. Just 3000 of the units are available to Japanese consumers through the company's Shop1048 online retailing operation, selling for Y29800, or just under £200. A single refill of methanol is enough for the unit to recharge a mobile phone twice; refilling takes approximately 20sec, and the 50ml methanol cartridges will cost a little over £20 for a pack of five. The company says the limited release of this, its first commercial miniature fuel-cell product, is to assess demand. Inside Dynario is a 14ml fuel tank, the cell in which the methanol reacts with ambient oxygen to generate power, a lithium-ion battery to store the power and a microcomputer to control the process. The unit is capable of delivering 5V DC and a current of 400mA, is around 15cm wide and 7.5cm tall, and weighs about 280g without fuel. The only drawback – well, apart from having to carry the unit and a little bottle of methanol around with you – is that safety regulations mean you can't take it with you when you fly, although apparently it's fine to use it on trains and buses.